﻿ book pick: when you are engulfed in flames. book pick: when you are engulfed in flames. To say I love David Sedaris is putting it mildly. The man is a wildly talented writer and storyteller. Not only has he written several books he’s a regular contributor to This American Life, one of my absolute favorite shows on N.P.R. There have been times listening to him where I’ve literally had to pull the car to the side of the road so as not to endanger the lives of my children. He’s that funny. 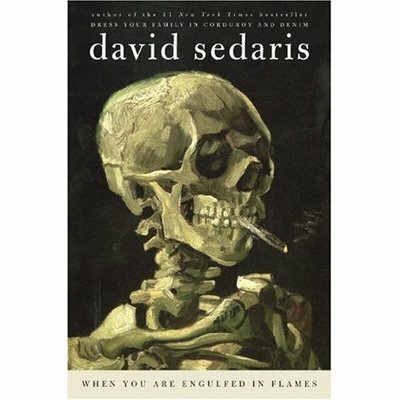 Sedaris’ most recent collection of stories ‘When You Are Engulfed In Flames‘ does not disappoint. I enjoyed it thoroughly from beginning to end, especially the chapter detailing his time spent living with an eccentric antique collector and her slew of boarders. Classic. Sedaris isn’t for the faint-of-heart; he has a comfortable relationship with profanity and vulgarity. Disclaimer aside he’s one of my top 10 favorite authors, never failing to impress. So cool- I wrote about DS ( my fave too) and This American Life this week. Great minds think alike. He really is the best isn’t he? ooh, i’m glad you wrote this review. i love david sedaris as well but i haven’t read his new one yet…something to look forward to!